Additional closures may be needed without notice. 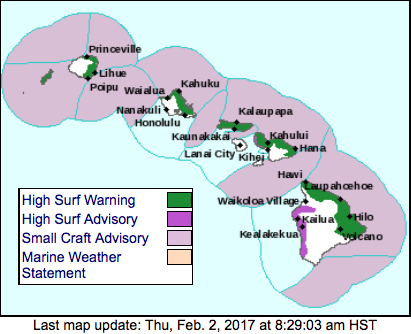 The National Weather Service in Honolulu has extended the High Surf Warning for west, north and east facing shores of Hawaii Island through 6 p.m. this evening (Feb 2). Dangerous surf will continue to impact the exposed coastal areas today before gradually lowering tonight into Friday. Overwash from waves onto the typical vulnerable roadways will remain possible today especially at and around high tide. Surf along north and east facing shores is forecast to be in the 15-25 foot range. Surf along west facing shores of Hawaii Island is forecast to be in the 6-9 foot range.